Obesity and unhealthy behaviors are costing the U.S. economy hundreds of billions of dollars annually. But, as noted in the first article in this series, the well-being picture is much brighter among millennials. For example, 20.1% of U.S. millennials are obese, compared with 32.5% of non-millennial adults, and only millennials have seen their obesity rate go down since 2008. Millennials have also bucked the trend in the rise of diabetes nationally, with a 0.5-percentage-point reduction in diabetes compared with 19- to 35-year-olds in 2008, while rates have relentlessly climbed among all other adults. 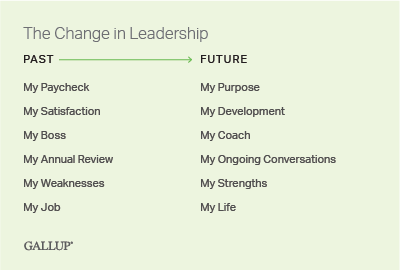 With millennials now making up nearly two-fifths (38%) of the U.S. workforce, leaders have a unique opportunity to build upon the generation's positive well-being momentum to lead broader improvements across the American workforce. With this opportunity comes the need to manage millennials in a way that cultivates and encourages their healthy choices and leverages their example for others to emulate. By doing so, leaders have a real chance to meaningfully improve the critical business outcomes that well-being significantly influences. 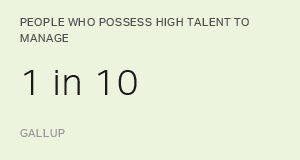 Gallup's latest report, How Millennials Want to Work and Live, reveals six major differences between the expectations American millennials and those in previous generations have for their management and workplace. Millennials don't just want a job and a paycheck; they want purpose in their work and work that integrates with their life. They are looking for development and ongoing conversations rather than sheer job satisfaction and annual reviews. They want their manager to be a coach, not a traditional boss. And they want to be managed according to their strengths, not their weaknesses. Each of these disciplines connects to millennials' well-being, allowing organizations to harness their power to attain outcomes critical to economic success. The improvement since 2008 in many key metrics of physical well-being among millennials gives leaders a unique opportunity to leverage this momentum and amplify it, thus maximizing the potential of their human capital for the next 30 years. Help millennials understand how their roles are linked to the purpose of their organization, and how their well-being affects both. Leaders can make sure millennials understand that the organization can't fully achieve its purpose without a workforce that is strong in well-being. And leaders can paint a picture for each employee demonstrating that fulfilling the organization's purpose is dependent, in part, on their personal well-being. Build engagement among workers while simultaneously connecting key engagement levers with well-being outcomes. Engagement is proven to enhance employee participation in well-being programs, and engaged employees are much more likely to feel comfortable discussing well-being with their managers than are disengaged employees. Among millennials, however, just 29% are engaged in their jobs, underscoring the missed opportunity for well-being enhancement. Determine and leverage the unique strengths of each individual in pursuit of better well-being. If an employee is highly competitive or achievement-oriented, encourage him or her to get into stair-climbing contests that tally the number of stairs climbed each day, trended over time. If the person is a relator, encourage him or her to join a team that volunteers in the community as a group each month. Learn their strengths and then build strategies for enhancing their well-being based on what they lead with every day. And, as an added benefit, employees whose manager focuses on their strengths are vastly more likely to be engaged than are those whose manager focuses on their weaknesses. Leverage millennials' greatly elevated use of the internet in their everyday lives. Research has shown that mobile applications play a real and significant role in improving both physical and social well-being. Workplaces can and should cultivate these behaviors by encouraging employees to share their frequently used and valued well-being apps with one another. Make sure millennials are having ongoing conversations with their managers -- and not always about work. Openness to discussing retirement and savings options; partnership in setting and pursuing fitness goals; and collaboration in ideas and efforts to improve the community are all ways that managers can have ongoing conversations with millennials that extend beyond the workplace and embrace well-being principles. Give millennials the development they crave. But it should be about the whole person, not just the career -- aptly positioning well-being as something that involves learning and growth. Millennials like to be held accountable, and managers who treat well-being-related activities as fair game in employees' personal development will be better-positioned to prompt these behaviors and embed them culturally within the organization. There are likely a number of factors that have ultimately led to improved health statistics among millennials since 2008. A possible one is the growing emphasis on well-being embraced by employers, who are increasingly recognizing the significant return on investment in well-being. Employers have a real possibility now to harness and leverage a new generation of workers who are showing better health habits than their predecessors.